Ah, summer break. The mental health break that teachers get from June through August. This recipe was on last week’s menu, but wasn’t actually made until today. I’ve had all the ingredients on hand for that period of time, but it just happened to get overlooked. Today, after a busy afternoon in the garden, I wanted to eat something quick and filling. I had a taste for pasta, but wasn’t in the mood to make lasagna (originally on this week’s list). A perfect dish for someone who is too lazy looking to make something quick, tasty, and filling. Not to mention, I only used one pot! 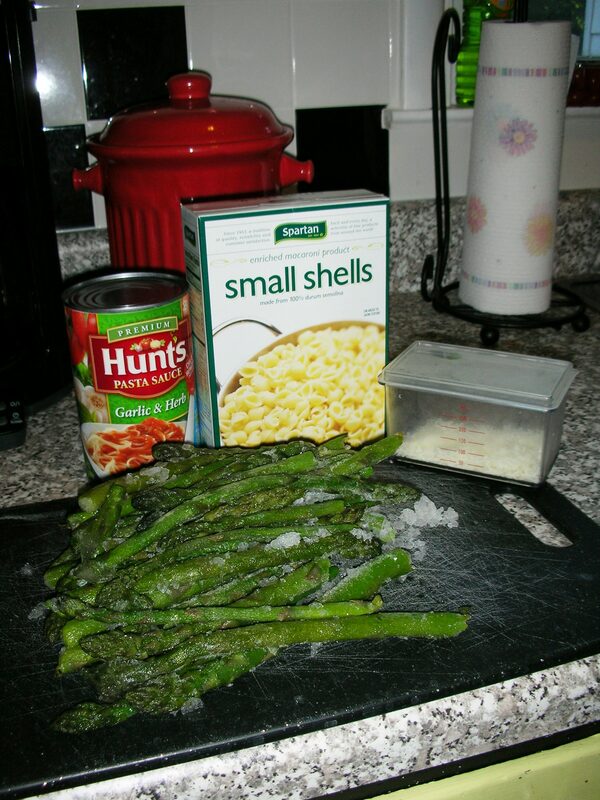 1 bunch asparagus, tough ends removed, chopped into small pieces. Boil about 4-5 inches of water in a large pot. When it is boiling, add pasta. About 5 minutes into the boil, add asparagus. Boil two additional minutes, then drain, saving a bit of liquid in the bottom of the pot. Add sauce, cheese, and salt & pepper. Mix well until all is combined. EAT! My methods for making this dish varied from the original recipe, in that I honestly didn’t want to use several pots. In another dish on Gina’s site, she boiled pasta and broccoli in the same pot. I figured, what was the difference? The results were exactly what I wanted and I saved myself another pot to wash (washing pots and pans is my #2 most hated chore. After mopping. But I digress). As for the sauce…DISCLAIMER: I am in no way affiliated with Hunts in any way, nor am I paid to use their product. When it came to quick spaghetti sauces, it’s what my mom always used (and she’s Italian, so don’t argue!). You use Hunts spaghetti sauce, and add any herbs/garlic/spices that you have a taste for. Today I added some Pasta Sprinkle (shown another day), and garlic powder. You may notice from the above photo that my asparagus is icy. A few weeks ago, Mike purchased 5 10 pounds of fresh asparagus from a friend of a friend/coworker. I blanched most of it (the rest we ate!) and froze it in 1-lb batches. Now, I can pull fresh asparagus out of the next freezer for the next, oh, 7-8 dishes that we will use asparagus for. It especially comes in handy once it is out of season, and the price goes up. So thus, icy asparagus, which I cut using a pair of kitchen scissors. Nothing says spring/summer like FRESH asparagus. 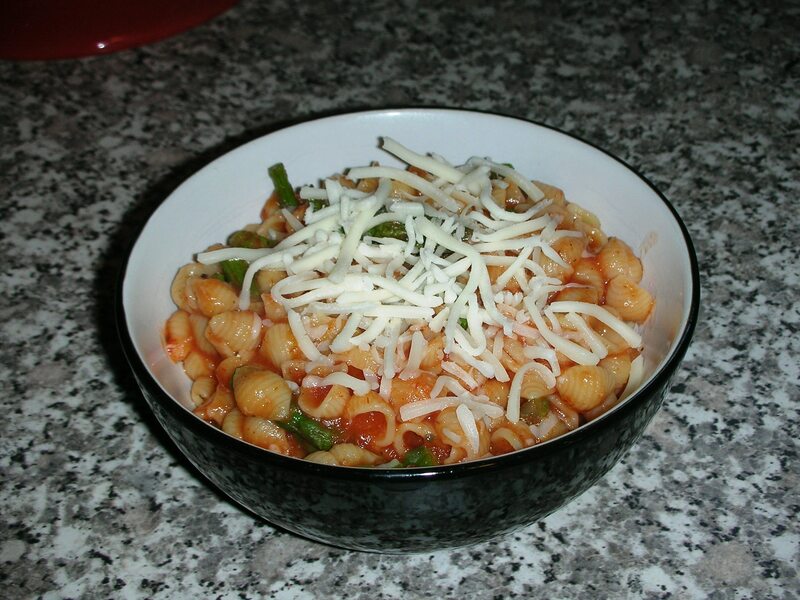 Last, I topped my dish with a blend of mozzerella and provolone cheese, which I found at the grocery store. Yum. Baby Pasta Shells with Asparagus & Marinara Topped with mozzarella & provolone. I made twice the amount of the original recipe, since my husband takes plenty for lunch/dinner at work. And trust me, this dish makes a lot of leftovers. Quick, easy, filling, and relatively healthy 🙂 Enjoy!